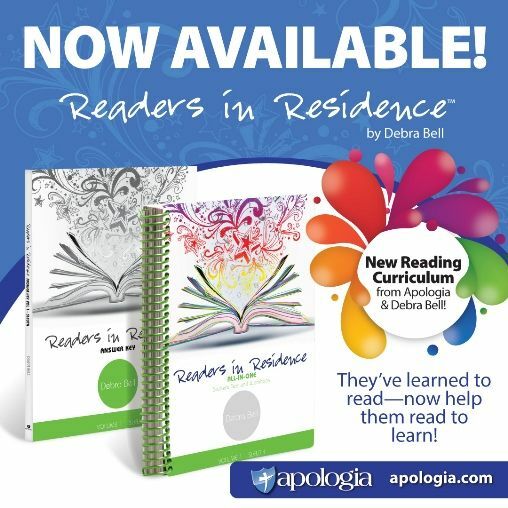 Apologia Educational Ministries has a brand new homeschool reading curriculum from Debra Bell called Readers in Residence Volume 1 (Sleuth). 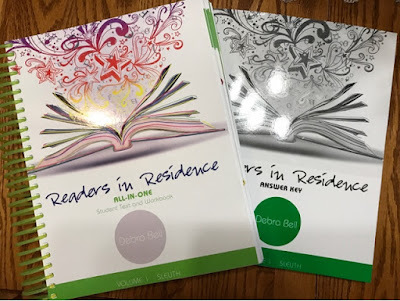 Readers in Residence is a reading comprehension, literature, and vocabulary program to teach children in grades 4-6 how to read to learn. Students will read Sarah, Plain and Tall, Charlotte's Web, Because of Winn Dixie, and three more books of their choice. They will read for understanding, learn to recognize elements of literature, identify figures of speech, and increase their vocabulary. It comes with the all-in-one student text and workbook, and the answer key. The student text and workbook is a 562-page spiral bound book. It is very pretty to look at with colored pictures and squiggles throughout. There are six units, one for each book read. The six books read are from three genres of narrative fiction. The suggested daily schedule recommends using this curriculum 4 days a week completing the entire curriculum in 32 weeks. It also recommends starting a book club with your friends or relatives to make reading more enjoyable. 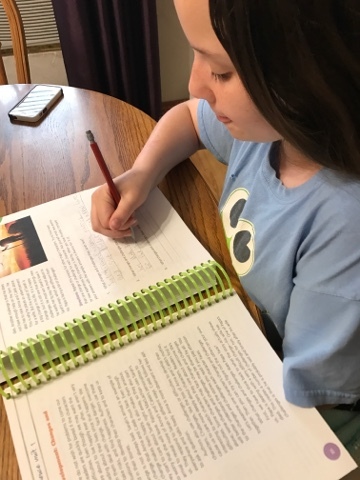 Each Unit includes an introduction to the author, a rubric, checklists, reading assignments, and reading comprehension questions designed to help students understand basic events and help them make accurate inferences about the story events. Some of the activities include creating a book cover, charts, and diagrams. The Answer key is a 232-page softcover book that includes an introduction to the program, guidelines for evaluations, and answers to certain questions. Some questions do not have an exact answer, so some do not have answers or they may have suggested answers. Readers in Residence is recommended for children in grades 4-6. I decided to use this with Alaina, who is older than the recommended age range for a couple of reasons. She is a good reader and she has good reading comprehension, but she doesn't like to read. All my other kids have always enjoyed reading and constantly have a pile of books to read. Alaina has a few favorite authors, but she doesn't like to step out of her comfort zone. Since she enjoyed using Writers in Residence last year & because Alaina was already familiar with the books included in Readers in Residence I thought she might actually enjoy these books as opposed to forcing her to read something she didn't really want to. Some of the suggested books to read for the On Your Own Units are recommended for grades 6-8 and this has been a good fit for Alaina. Alaina has been enjoying Readers in Residence. One of the main reasons she likes it is because there is a daily schedule and checklists for each Module. She said she knows exactly what she needs to do each day and she loves to mark off each box. Even though this curriculum is written directly to the student we still like to discuss books out loud together. That is probably why they suggest starting a book club with your friends or your family members. So some of the questions we talked about together, this is especially helpful on the inference questions. If Alaina wasn't sure about something I could lead her into thinking ahead. She also likes the symbols that are included. There are colored boxes with binoculars that list what will be learned in that module, and when an excerpt from the book is included in the student book it is indicated by a picture of a book. There are also blurbs in the side margin that include definitions or things to think about. A full year of language arts is covered when you use Readers in Residence along with Writers in Residence. Sleuth is Volume 1 in the Readers in Residence curriculum with Volume 2- Detective, Volume 3- Investigator, and Volume 4-Analyst already being planned.